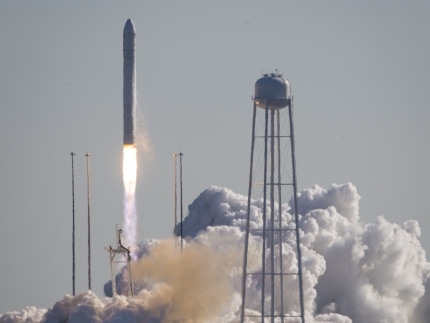 Orbital Sciences Corporation’s Antares rocket lifted off precisely on time, at 1:07 p.m. EST today, carrying the company’s Cygnus cargo vessel. Following a flawless liftoff, Cygnus was released from the second stage, deploying its solar panels a few moments later. With today’s launch, OSC has now completed three successful flights of the two stage, liquid and solid fueled booster, with all three flights taking place well inside of a year. Today’s flight marked the first time Antares has flown with the Castor 30B solid second stage, which burned approximately 12 seconds longer than the standard 30 stage used on the previous two flights.